Welcome to Luxor the site of Thebes " city of hundred gates". Although modern Luxor contains the usual tourist attractions of hotels, nightclubs and restaurants there is plenty of history to be absorbed in Luxor proper. Luxor was the capital of Egypt from 1991 BC (the 12th dynasty) through the Middle and New Kingdoms. Luxor also housed Thebes' mud brick palaces and various structures comply with an 'ancient' building code. For example the National bank of Egypt , the spa south of the police station, and the railway station follow the design of buildings from the pharaonic period. Luxor contains many sites of interest including Luxor Temple, which is an informative history book. A history book which details the cultures and beliefs of various peoples including the Greeks, Romans, Christians and Muslims. Luxor Temple is located a mile south of Karnak Temple on the east bank of the Nile. Interestingly Karnak and Luxor temples were once linked together by an avenue called a dromos. The dromos was lined on either side with a row of human-headed stone sphinxes. The dromos was built by Nectanebo I. 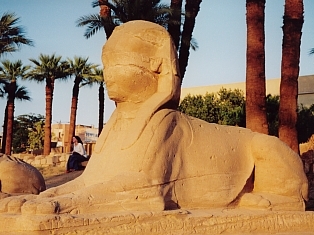 The ancient egyptians believed that sphinxes were "Guardians of the temple gates and the underworld". The remains of the dromos (1st and 2nd photographs on the page) can still be seen today at the entrance to Luxor Temple. In front of the main gates (pylons) to the temple is an obelisk. The obelisk is one of a red granite pair erected by Ramesses II. The other obeslisk was placed in the Place de la Concorde, in Paris on the 25th of October 1836. Every face of the obelisk contains inscriptions stating the names and titles of Ramesses the Great. Whilst the pedestal of the obelisk has carvings of the four sacred baboons. 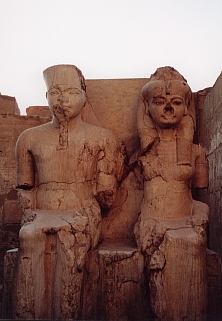 In front of the pylon there was also six statues (4 seated, 2 standing) of Rameses of which only three remain today. On the face of the great pylon itself are carvings illustrating the Battle of Kadesh, when Ramesses and his army defeated the forces of the Hittites and their allies. The pylon is around 24m high. The pylon entrance leads into the court of Ramesses II which contains statues (photograph 4) bearing the name of Ramesses II but the feathers of Tutankhamen. 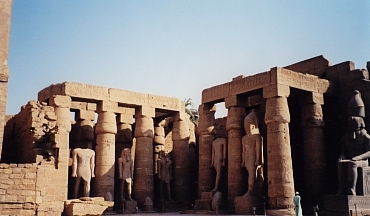 The court of Rameses II is the original forecourt of Amenhotep III's building. The court is surrounded by a double row of columns with lotus bud capitals on the east and west side of the court. The columns on the north side no longer remain. On the south side of the court is a Hypostyle Hall which has four rows of eight columns. During the Christian era the temple's hypostyle hall was converted into a Christian church. On the south wall are reliefs depicting the coronation of Amenhotep II by the gods. Within the court can be seen the tip of the minaret of the mosque of Abu'l Haggag. This is because at one point the temple at Luxor was buried beneath the town of Luxor which included the mosque. When the temple was recovered a decision was made to retain the mosque built by Sufi Shaykh Yusuf Abu al-Hajjaj. Around each of the sides of the court the colonnade of Amenhotep III has been formed with 14 papyrus columns. It is believed that the temple's main purpose was to provide a setting for the rituals of the annual Opet festival following the ancient Egyptian's reversion back to Theban orthodoxy. Therefore the inside of the east and west walls of the Colonnade depict the annual Opet festival. The reliefs show the Opet procession to and from karnak including the sacred barges used by the God Amun. Although the reliefs are from Tutankamun's period his name has been changed to Horemheb in the texts on the walls. Behind the colonnade is the columned court of Amenhotep III, which houses the barque shrines of Mut and Khonsu at its southern end. 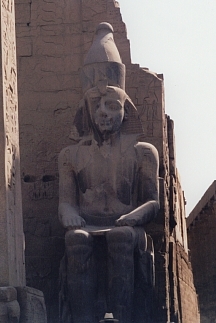 During the restoration works of 1989 various statues were found buried in the court of Amenhotep III. These statues are now displayed in Luxor Museum. The room on the south side of the court was used as a cult chapel by the roman legion based at Luxor during the third century AD. The romans inadvertently preserved the reliefs of Amenhotep II by painting and whitewashing over them. The Temple at Luxor also contains a number of Antechambers, a sanctuary,a vestibule and a birth room. On the west wall of the birth room, there are reliefs illustrating the birth of Amenhotep II. Amenhotep II claimed that he was the son of Amun. Amenhotep II believed that Amun disguised himself as Tuthmosis IV, entered the queen's chambers and breathed the child into her nostrils. There are also depictions of the creator god Khnum fashioning the baby king Amenhotep III with his ka behind him. Mutemwiya (queen) can be seen giving birth to Amenhotep and the newborn king is presented to the gods. The offering hall or vestibule is illustrated with scenes of the pharaoh making sacrifices and offerings to the gods. The sanctuary contains a reminder of the Egyptian reign of Alexander the Great in the form of a free-standing granite shrine. This shrine was built by Alexander the Great and depicts the Greek king as Pharaoh. Luxor Temple was dedicated to the Theban triad of the great god Amun-Re( in his fertility role), his wife Mut and their son Khonsu. As blocks have been discovered from the middle kingdom, the temple was probably built on the site of a smaller middle kingdom structure for the God Amun. Whilst the visible parts of today are from the 14th century BC and the time of Amenhotep III (the 18th Dynasty of the New Kingdom). This is because Amenhotep III's son, Akhenaten (Amenhotep IV), overthrew the existing order of Amun and replaced it with the cult of the sun god Aten. During the promotion of his cult Akhenaten did not look after Luxor Temple. Fortunately after the return to Theban orthodoxy, Tutankhamun and Horemheb both commissioned restoration work. Consequently Luxor temple is one of the few places where a statue of the boy king Tutankhamun and his child bride can be found (photograph on the left). If during your visit, you would like to continue exploring the delights of Luxor, visit Luxor Museum on your way to Karnak.